Most days will start with a morning lecture and discussions. Afternoons will typically include more hands-on activities as well as discussions and special talks. There will be evening activities on several nights, usually including planetarium shows, movie night, and observing sessions on University of Wyoming telescopes. Five days of lectures will cover the fundamentals of introductory astronomy at the college level (we will not try to cram a semester of material into a single week, but it will still be a firehose of information!). Topics we will cover: the seasons, phases of the moon, historical astronomy, misconceptions, the electromagnetic spectrum, gravity and orbits, planets, stars, galaxies, and cosmology. Additional afternoon talks will focus on special interest topics like black holes, and extrasolar planets. Afternoon hands-on activities will include how raw astronomical data is transformed into poster-quality images, and several laboratory demonstrations/exercises. Mike Brotherton has several blog entries that include videos of Launch Pad lectures, a reunion podcast, and a list of online astronomical resources that are referred to during Launch Pad. 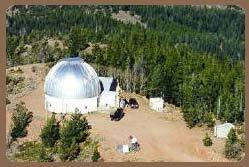 Evening activities may include: good and bad astronomy in movies/TV, a planetarium show, telescope observations using small individual rooftop telescopes and/or trips to use our 24 inch telescope at Red Buttes Observatory, RBO, and our 2.3 meter telescope at the Wyoming Infrared Obervatory, WIRO. The observing sessions may be cool, so participants should bring appropriate clothing. We sometimes manage to squeeze in an opportunity to visit/hike at Vedauwoo, a picturesque area near Laramie famous for its rock climbing.